Alumni are “low hanging fruit” – an under used group who can be mobilized to good purposes. It’s time for a revolution in alumni/student/pupil relations with respect to support of entrepreneurship. North Americans tend to be good at this – Europeans not yet. Every entrepreneur is an alumni of somewhere. I’m starting with several assumptions. People who have started businesses -entrepreneurs – have experience, know how, insights and characteristics and (sometimes) money that would be valuable to share with people who are thinking of starting a business, whether alumni, students, or others. Students would benefit from be able to listen to, ask questions and interact with entrepreneurs, and other students interested in entrepreneurship. the benefits would include increasing the chances that people who had such experiences and interactions will start new ventures, and if they do, both reduce the risk of failure and increase the scale of success. Having more new initiatives and business ventures will change the world for the better faster, increasing human prosperity and welfare. The internet makes the spreading of new ideas and the organisation of new movements easier, cheaper and faster than at any time in human history. Many “pro-entrepreneurship events” are badly run and do not achieve nearly as much as they could. There is a better way of running events. Years of organising TEDx events, Open Coffee Krakow events, Krakow Enterprise Mondays and speaking at multiple entrepreneurship related conferences has given me a strong insight into what makes an event special. 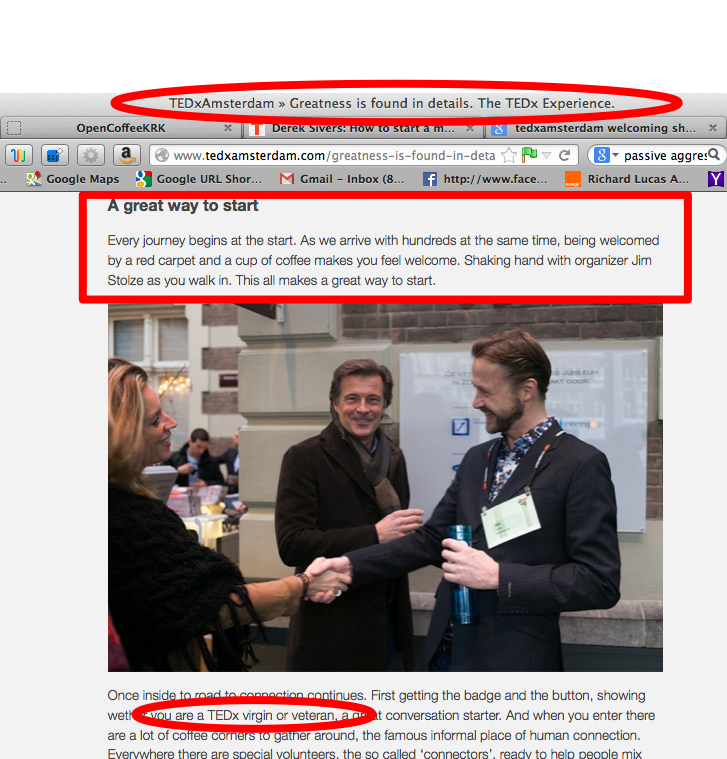 I was even asked to do a workshop about this at TED – who do the best events I’ve ever attended. 8. if more alumni become successful – and the place they studied has had a part in their success- it may positively impact on the school/university in terms of increased donations. 1 Most alumni are not actively engaged in the the life of the place they studied at all. 2 To the extent that some alumni are engaged somewhat, they are not actively engaged. They might show up once or twice a year, and/or send some money. I will be more than glad to cite honourable exceptions. I want to be wrong. 3. A major purpose of engagement from the point of view of the School/University is fund raising. The thought that the alma mater is going to ask for money may act as a disincentive for alumni to engage. What are the components of a revolution? The bad news is here are several components and to achieve full impact they all need to work together smoothly. This is not easy and will take time and effort from those who share the vision. The purpose needs to be made clear. Entrepreneurship is not just about making money it is about encouraging people and teams to take the risk to start social and business projects that may lead to making the world a better place and celebrating the fact that there are those people who are ready to take the risk. While the alumni contacted need to be asked and prompted to think about what they able and willing to do in networking and helping each other current students, and others, it is probably best to start with early adopters. In any community there are the natural leaders who are most active and committed, and the least with most people being somewhere in the middle. It’s important to identify these early adopters and leaders and work with them so that those who might be willing to get involved but are not sure, having inspirational people to follow and work with. This project may be best done in co-operation with the Development Office, the Careers Office, the Alumni Relations office and/or independent Unofficial Linkedin/Facebook Groups. This is a case by case decision based on the current situation. It is worth making contact with these organisations to see what they think and whether they want to help. 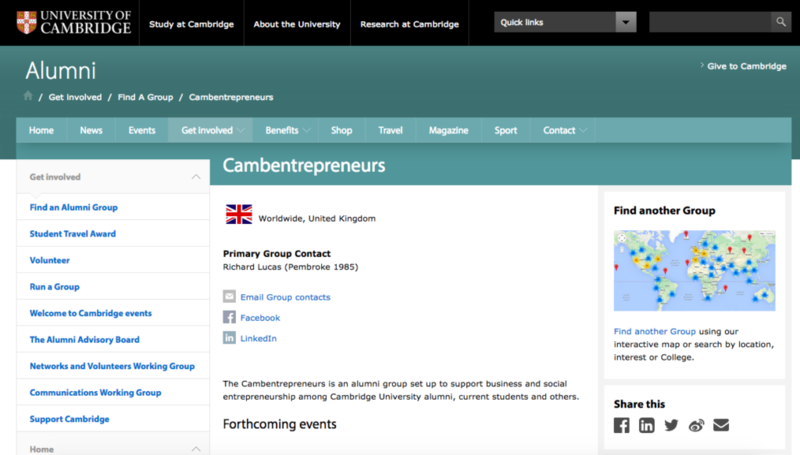 At Cambridge University – the alumni office supported the formation of an officially sanctioned group Camentrepreneurs. 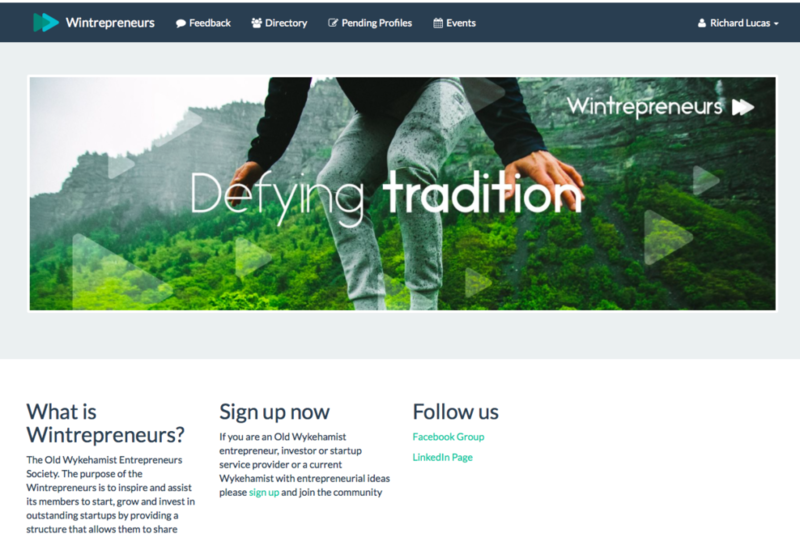 modelled on Etonpreneurs aimed to operate independently – in co-operation with the School In October 2017 I was asked *not* to organise a meeting to launch in Winchester because the School was worried about “Safeguarding” legislation. (I had been invited to give a talk in the school, was flying 2000 miles to be there, and thought I would start things off while I was there). Apart from the referring to of my voluntary initiative to encourage entrepreneurship as a “scheme” (which – excluding the costs of my time – I had put a thousand or more pounds into making happen) – a message like this underlines the challenges for those who want to change things. Informal self-organising communities of alumni and pupils are not what is wanted. It’s the antidote to the optimism of TEDster Clay Shirky’s talk about the Grobanites. My “sanctioned” talk to the pupils went well, and for those interested, I recommended these entrepreneurship related resources. In Kraków, Poland where I live – an Alumni Association of a famous University is so unsupportive that it not only does not have time to to meet to discuss the idea, it is too busy to answer questions about their activities by e-mail. An important and hard to map challenge is to find out who in a School/University are responsible for inviting guests, be they teachers, parents or pupils. What sort of people are invited at present, what sort of events take place at which entrepreneurial alumni would be welcome and helpful. It is sometimes easier to build on top of existing institutions and practices (like guest lecture series) than do something entirely new. On the other hand if there is the ambition and local leadership aiming to “do things better” than normal, a dedicated event offers more control. What awareness is there of the potential of alumni to contribute to the purpose of the School/University ? and what would they like alumni to contribute? At some schools I have spoken I have spoken at I have been the first entrepreneur school pupils have ever met. It would be a mistake to assume to that everyone knows what the potential of this asset is. Sometimes guest workshops can fit very well some parts of the curriculum. This means it is important to ask and find out what platforms are there for spreading information about the benefits of this practice. Is there a school web site, newsletter, school magazine, Facebook page, or Linkedin group where an article about the idea can be published? Who can write an article about the topic ? If there is a local leader they need to think about what they would like the local situation to look like? If there are to be regular meet ups, basic “who? what? whens, where ? Who is in charge? owns the process: how frequent the meetings should be? with what format? questions need to be asked. If you are at this stage I can provide some input and support, if you share my values. Icebreakers, Short talks, Q&A, Office Hours, Community Announcements, Education, Pitches are the basic ingredients, together with a laser like focus on welcoming and participant experience. Doing good events, not just events is vital,. Existing assets and relationships need to researched be understood. There may be particularly active staff, alumni, teachers, pupils or organisations that can be ideal for spreading the idea. Getting these people on board can be a game changer. They need to feel you are co-operating not competing. It is important to look at the values and attitudes of the existing community and defining what is going to be important to the early adopters. I’ve made clear for the movements I lead that despite (maybe because of) their elite position they are “Open” in the sense that they are not Cambridge or Winchester “only” they are Cambridge or Winchester “and”. It is not for me to define the values that matter to those reading this, but it is important to make sure the founders of your initiative know what they stand for. Processes and habits take time to build. Assessing local competences and skills is important. In some cases there may be a need to “train the trainers”/ Teaching the entrepreneurs to teach. This is very much a question of local conditions. Many entrepreneurs are natural trainers, because they have had to do develop on boarding and training processes for all their staff. In other cases, one person entrepreneurs/freelancers (or people in the school/University) may have no idea how important training and development is to successful enterprises, because they never thought about it. A really bad workshop may be worse than nothing, although as my father told me “the best is sometimes the enemy of the good.” If you care and want to do a good event, it is better to do something than nothing. There has never been so much know how available for free as now. 3. to celebrate the business success of alumni. and the sense that the current generation of students appreciate and value entrepreneurial success. 5 to provide a business friendly environment where students from different universities in Krakow can meet and get to know each other, and develop their networks. You need to know your objectives. objectives for alumni/entrepreneurs might include: feeling good, valued, and useful, making new contacts, finding new staff, co-founders, clients, suppliers, partners, investors , and well as having fun. objectives for students may include learning new skills, being inspired, making new contacts, finding jobs, investors, co founders, and having fun. and believe the world needs more entrepreneurship, join me in making this revolution happen. I’ll do my best to help. ← Kraków – Doliną Krzemową? Krakow Silicon Valley ?